Marc Cooper crafted all-natural, all-decadent toppings for us to pour over anything we want. Whoever said, "I think ice cream could be more delicious: What if I put gooey chocolate on top?" is our kindred dessert spirit. Marc Cooper must feel the same way, because the ice cream-turned-fudge maker has crafted three all-natural, all-decadent toppings for us to pour over anything we want. We're using the classic Chocolate Fudge to make the best cake icing ever, and we're going to spread our morning baguette with a little Mocha (there's coffee in it, so breakfast). Salted Caramel? That's getting spooned straight from the jar and into our mouth. Handmade in Boston, where Marc partners with the employment training program Working Opportunities for Women. Marc "Coop" Cooper was an electrical engineer and hospital administrator who decided to learn how to make super premium ice cream. After running two popular ice cream shops for 25 years, he started playing around with a hot fudge recipe. In not-so surprising news, it was quite delicious, and quite popular. Eventually he added new saucy spins, including vegan, salted caramel, and cold brew mocha. But wait, there’s more good stuff: Marc also partners with Working Opportunities for Women, an employment training program in Boston, where he makes his sweet treats. Uncommongoods is my new favorite "go to for gifts" website! I bought this gift as part of a birthday basket for my sister who has everything. It was a huge hit! She has two young children and they all had a ball making birthday sundaes. It made the gift part of a much bigger event and made memories in the process!!! We ordered the salted caramel and chocolate topping from a different company and paid for two what you pay for the trio here on Uncommon Goods. 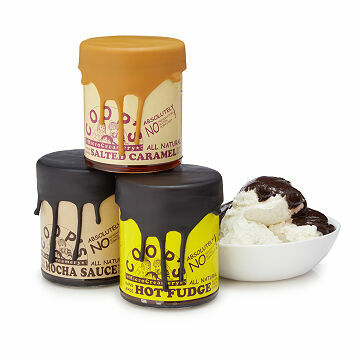 These sauces are ah-mazing with great, rich tastes! They tasted wonderful on ice cream sundaes and we also used the salted caramel on top of homemade cereal bars. The sauce is nice and thick and warms up nicely in the microwave. We especially love that there are no added chemicals or colors and we are supporting a small US business when we buy it! We will definitely be buying this from Uncommon Goods!